You can do crunches all day, but to really get flat abs you need the right foods. Here are five secret ingredients to help you get a tight stomach. You bend and turn, twist and burn, all in an effort to lose that gut, but your pooch persists. What can you do? Look at the food you're feeding your body and replace some of the belly busters with slimming treats. You know you can't eat 4,000 calories a day and get great abs, but it's not just about the calorie count when it comes to a flat stomach – it's also about the food. "All things being equal, if your daily caloric intake is set at 1,400 calories, a diet of nutrient-rich foods is going to keep you fuller longer, reducing your cravings and giving you more energy, compared to the same number of calories of less nutritious food, which will help you on your road to a better body," says registered dietitian Tracey Ryan. The five foods you'll need for flatter abs will help you be healthier and leaner. Plus, you'll be pleasantly surprised by some of our diet suggestions. 1. Orange Fruits and Veggies: According to a recent review from Copenhagen University Hospital, the best way to whittle down your waist is to replace carbohydrates from sugar and refined grains (like white bread) with carbs from fruits and vegetables. Orange-hued foods were found to be the most effective substitutes. 2. Lean Meats: You should be getting about 25 percent of your daily calories from protein, Ryan says, but you should make sure to choose lean sources like poultry, fish, low-fat yogurt, and fat-free milk to keep calories down. Nuts are also high in protein, but can also be high in calories, so eat them in moderation. Tracey recommends roughly a handful a day. Protein helps to keep you feeling full and boost your energy, aiding in your weight-loss efforts. According to research from Skidmore College and Copenhagen University Hospital, eating additional protein is especially helpful for those over 40 in reducing abdominal fat. 3. Nuts: A recent survey of more than 8,000 Americans found that selenium, a cancer-fighting mineral, seemed to also lower rates of abdominal obesity, reporting that those with lower levels of selenium had larger waistlines. Several foods contain selenium, so it's hard to know if you're getting your recommended 55 mcg per day. The best sources are nuts (especially Brazil nuts), whole grains, poultry, red meat and seafood. Foods rich in vitamin E, such as nuts and seeds, will increase the effectiveness of selenium in the body. Your best bet to get enough selenium is to eat a varied, balanced diet or try a supplement containing the mineral. 4. Wine: Several studies suggest that light drinking, compared to teetotaling, protects against weight gain around the waistline in women. Data reviewed by the National Center for Health Statistics points to one 4-ounce glass of wine as the best bet. The key to boozing and losing is the "less is more" philosophy. While one glass has great health benefits, having more is just going to add inches to your waist and cause you to think you're funnier, smarter and better looking than you really are. The only 6-pack you should be having is the one under your shirt. 5. Fish: There's a difference between good and bad fats. Eating good fats like monounsaturated and omega-3s make it easier to stay slim, according to recent research. "The healthy fats, like monounsaturated and polyunsaturated fats, are found in fish, nuts, olive oil and avocado, while the bad fats, like saturated and trans are found in butter, shortening, pre-packaged cakes and cookies," Ryan says. A Wake Forest University study found that over a 6-year period, participants whose only source of fat was trans fats gained 30 percent more fat in their abdominal region and had early signs of diabetes. You don't have to fear fats if you know which are good and bad. Exercise and follow these simple guidelines and you'll be on your way to an abs-olutely amazing midsection! The above article was found online at ediets.com A diet rich in these delicious whole foods will not only help your abs to be flatter but they will help your heart to be healthier, your mind to be clearer, and your health to better all around. If you aren't getting these whole food nutrients daily make sure to take high quality supplements. Visit my web site to find these and other excellent whole food nutrients. Enjoy Nature's Sunshine 100% Pure High Quality Herbal Nutrition Everyday! All Nature's Sunshine Memberships are free with a $40. order. The Nature's Fresh line of household products is a safe and effective alternative to common household cleaning agents that may not be safe or environmentally friendly. The NATURE'S FRESH line of home cleaning products is formulated with all-natural, plant-derived biodegradable ingredients that are safe for you, your family and our planet. 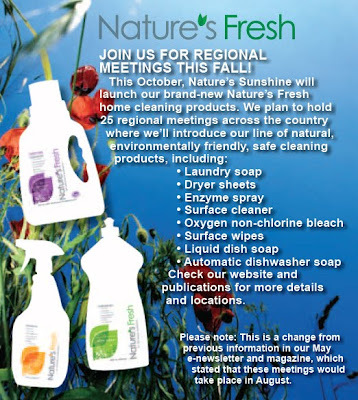 NATURE'S FRESH is an alternative to other household products that may contain harsh chemicals or unfriendly cleaning agents that can cause irritation or other allergic reactions. Since 1972 we've formulated safe, effective nutritional supplements, and now we've created our NATURE'S FRESH household products in keeping with that same philosophy of safety and effectiveness. Taking a safer, greener approach to the way you clean your clothes and your home may help you feel better physically. You may be used to the fumes, irritation and other mal-effects of your chemical cleaners, and you may be surprised at how much better you feel when you eliminate these chemicals from your home! Plus, you'll have more peace of mind knowing that you are now part of the environmentally conscious crowd. Contains: Purified water, 100% natural anionic coconut kernel oil based surfactant. Contains: sodium percarbonate and sodium carbonate. NATURE'S FRESH BAMBOO DRYER SHEETS [include bamboo water mark from label] are, well, made from bamboo. (How cool is that?). These dryer sheets are free from harmful softening agents and strong chemical fragrances. You won't find these sheets piling up in a landfill, because after they soften and freshen your laundry they biodegrade. NATURE'S FRESH ENZYME SPRAY is the same environmentally breakthrough enzyme spray that we've had and loved for decades, and is the eponym and inspiration for the rest of the NATURE'S FRESH product line. This unscented, hypoallergenic all-natural spray uses enzymes and proteins derived from vegetables and fruits to break down stains and odors. Contains: water, oxidoreductases, transferases, lyases, hydrolases, isomerases, ligases. NATURE'S FRESH SILVER SHIELD SURFACE WIPES not only effectively remove stains and spills, they contain Silver Shield to help protect your surfaces from unwanted, unfriendly invaders. Silver Shield is Nature's Sunshine's patented ingredient for combating microbes, and is 100% safe for you and the environment. Contains: water, alcohol, Silver Shield (silver: colloidal and ionic), and plant- based surfactants. NATURE'S FRESH CITRUS SURFACE CLEANER uses essential orange oil as a safe, effective and natural solvent to remove stains and clean surfaces. Use this citrus cleaner on any washable, non-porous surface; perfect for kitchens and bathrooms. The fresh citrus scent will make you happy. Contains: purified water, essential orange oil [Mandarin orange (Citrus sinensis)], plant-based biodegradable surfactants (from coconut). NATURE'S FRESH DISH SOAP is free from common, unfriendly cleaning agents such as phosphates and chlorine that are commonly found in dish soaps. Enjoy the fresh citrus scent of Sunshine Essential Oil Blend as you wash your dishes. This blend of essential oils not only helps clean and break-up grease, its citrus scent lifts your spirits while you wash. Contains: purified water, coconut oil derived surfactants, 100% pure Sunshine Essential Oil Blend [lemon oil, (Citrus limonum), lime oil (Citrus aurantifolia), mandarin orange (Citrus sinensis), grapefruit oil (Citrus paradise)]. NATURE'S FRESH AUTOMATIC DISHWASHER GEL is formulated to effectively clean your dishes and glassware with all-natural, plant-based ingredients. The cleaning agents in this product are 100% biodegradable and are free from common, unfriendly cleaning agents. This gel in concentrated (2x), and contains the Sunshine Essential Oil blend for both cleaning and aroma therapeutic enhancement! Contains: purified water, sodium citrate, xanthan gum, biodegradable low foam surfactants (from coconut), enzymes, 100% pure Sunshine Essential Oil Blend [lemon oil, (Citrus limonum), lime oil (Citrus aurantifolia), mandarin orange (Citrus sinensis), grapefruit oil (Citrus paradise)]. Do you use the following? STOP! Creep into water supply and settle in lakes. They stimulate certain marine growth and disrupt ecosystem . Biodegrade slowly and damage environment. Also, releases carcinogenic toxins during production. Highly toxic. When it reacts with organic materials it releases carcinogenic and toxic compounds. Biodegrades slowly, posing environmental dangers. Skin, eye and respiratory irritant. Suspected carcinogen. Caustic; irritant; eye and skin irritant. Know to California to cause cancer under Prop65, and is a suspected kidney and respiratory toxicant; groundwater contaminant. Visit my web site in October to read purchase these products. Please let me know how I can help you best. For those that don't know me, my name is Ray Lambert and I'm the Corporate Regional Manager for the Rockin' Western Region. This region includes Alaska, Arizona, California, Hawaii, Idaho, Nevada, Oregon and Washington. On July 15th, I was in Concord, California where we launched the Sunshine Community to approximately 100 excited NSP Managers. We also had another 62 people that participated via a webinar as well. The guest speaker was Laurence Smith, NSP Regional Manager from Idaho and he did a superb job teaching Epigenomics and introducing NSP's New & Improved Thai-Go! He did an amazing job and I'd like to share his presentation with you. I don't know how hot the weather is where you live, but here in St. George, Utah, it's really hot. Most days in July and August are over 100°F degrees. That's why the early pioneers who settled this area called St. George "purgatory" and Leeds (where I live) "north purgatory." Thank goodness for air conditioning. When I have to work outside in this heat, I can get tired pretty fast, but fortunately, I've learned a great way to help "beat the heat" using Nature's Sunshine's Thai-Go. You see, Thai-Go is loaded with sour, antioxidant-rich fruits and berries that not only reduce free radical damage, either, they actually reduce thirst and help you feel cool. In traditional herbalism, sour-tasting berries are considered cooling. Berries mature from early to late summer, right during the time when their cooling properties are most needed. It's also interesting that many of the highly promoted antioxidant fruits, like mangosteen (one of the main ingredients in Thai-Go) and açaí (which is in the new Thai-Go) are tropical fruits. Another ingredient in Thai-Go, lycium (also known as goji berry or wolfberry) is used in Chinese medicine for conditions of excess heat. Also, consider lemons. Think how cooling and refreshing a little lemonade can be on a hot summer day. Lemon is also a refrigerant, so it helps to reduce body heat. A couple of years ago a friend of mine was having to work installing heating and air conditioning units. So, he was crawling around in attics in the middle of summer when the temperature is over 100°F. This means that the temperature in the attics could be over 120°F. It was exhausting. So, I had him make lemonade with freshly squeezed lemon juice and maple syrup. But, we took it to the next level by adding Thai-Go to make Thai-Go Lemon-Aid. He put this in a thermos bottle and drank it while working in the heat. It made a huge difference and I've used it ever since for helping to cool down the body when it's hot. It's easy to make Thai-Go Lemonade-Aid, just juice four lemons and then add an equal amount of maple syrup and an equal amount of Thai-Go the lemon juice. So, if you have 1/4 cup of lemon juice, add 1/4 cup of Thai-Go and 1/4 cup of real maple syrup. (You can adjust the tartness by adding more or less maple syrup.) You then add this mixture to water to taste. Oh, and I highly recommend you don't add add ice or drink ice water. I learned from a friend a few years ago that ice water will actually make the heat feel worse! There was a group of about 6 or 7 of us working outside and everybody took a break and drank ice water except me and my friend. He said, "Watch, they'll all start getting cranky after drinking the ice water," and they all did. So, if you really want to cool down drink room temperature water. The reason for this is simple. Your body perspires to keep cool in the heat. Cold water pulls blood away from the skin into the stomach to warm it up. That reduces perspiration and makes you feel hotter. And, along the same lines, spicy foods and warm drinks will actually help cool you down faster. That's because they will increase blood flow to the skin and promote perspiration. Notice that highly spicy foods tend to come from tropical or hot areas like India, Thailand, Mexico and the Middle East. Spices also help you stay cool by dispersing excess heat from the interior of the body to the surface. Earlier this year I used my Thai-Go Lemon-Aid for a different purpose. I used it to keep me from having allergic reactions when I was working in the garden. I suffer allergic reactions to the dust in my garden, which is frustrating because I love working in the garden. I've tried Hista-Block and it helps, but it contains immature orange peel, which has synephrine, an epinephrine-like substance that dries the sinuses. The air is really dry where I live and drying out the sinuses causes problems for me. So, I needed to find another option and it turns out my Thai-Go Lemon-Aid did the trick. Vitamin C is a natural anti-histamine (which means that it helps the body break down histamine) and bioflavonoids (especially quercitin) stabilize mast cells. So, I figured the lemon would do me good. Since allergic reactions are an inflammatory cascade and Thai-Go inhibits inflammation, I thought it might help, too. Xanthones, found in mangosteen, also have an anti-allergenic action. So, I'd mix up the Thai-Go Lemon-Aid and drink several quarts of it on days I was working in the garden. In fact, I drank so much of it that I went through a whole bottle of Thai-Go in a week. However, it was well worth it because I had almost no allergic reactions. So, if the summer heat is getting to you, try a little Thai-Go Lemon-Aid. Just make sure you drink it room temperature or just slightly cool (not cold). Oh, and adding a sprig of peppermint or spearmint leaf (something aromatic to encourage perspiration) will make it even more cooling. Nature's Sunshine is introducing a new Thai-Go, so I've posting an article about the new Thai-Go in our articles area. I've also featured lemon as a single herb. We'll be adding more articles each week, so check back frequently to see what's new. Click here to view this weeks featured articles. Starting on August 12, I'll be teaching a nine-session Business and Success Coaching Program. 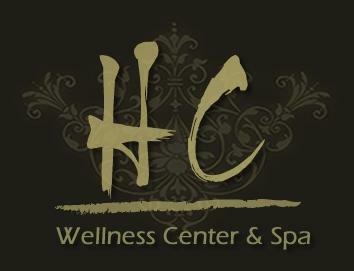 Certified Herbal Consultant (CHC) program. material in your own life. for $247, which entitles you to purchase one of our six CHC courses for just $100. That's a savings of $147 off the regular price. To learn more and register go to www.treelite.com or call us at 800-416-2887. If you missed last week's free webinar Emotional Healing: The Missing Link in Holistic Health Care you can view it online. This webinar explains some of the basic principles in Steven's new book, The Heart's Key to Health, Happiness and Success. It's not too late to register for the complete Heart's' Key webinar, either. We pushed the start date back from July 28 to August 4th to give more people a chance to participate. This webinar will provide amazingly practical information about how to turn "negative" emotions like anger, grief and fear into positive emotional experiences. It will also explain how unresolved issues with these emotions can result in physical illness. problems that had been going on for 30 years! So, don't miss out on this amazing webinar. Go to www.treelite.com to register today.